It’s that time again, when Democrats don folksy apparel and adopt phrases like “The North Dakota Way” and “working with both parties”. Don’t fall for it. Don’t vote Democrat, not even for dog catcher. Even Senators Conrad and Dorgan started small. Decades later they were North Dakotans on paper only, maintaining shoebox apartments in Bismarck to stay eligible for reelection. Their final legacy: casting deciding votes for Obamacare, legislation wildly unpopular with North Dakota voters, then retiring to multimillion dollar East Coast homes near their lobbyist cronies. 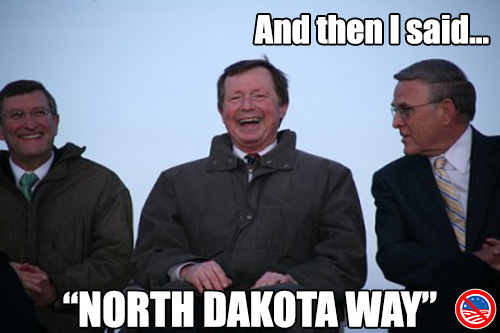 Was that the “North Dakota Way”? Then we elected the “Independent Voice™” for North Dakota, Heidi Heitkamp, who has since voted with her Democrat Party puppet masters 97% of the time according to Congressional Quarterly. We should have seen that one coming. Now Erin Oban, wife of the Democrat Party’s executive director, uses similar rhetoric. She doesn’t mention this affiliation; in fact, her website’s devoid of issues entirely. Her opponent’s site has a very clear list of where she stands on important issues and she votes as she promises on these issues. Democrats never actually campaign on what they stand for. Where are the campaign ads saying they support Obamacare, amnesty for illegals, the right to abortion, or gun control legislation? The ads promising to punish big corporations and advance the homosexual agenda? Conspicuously absent, but Democrats are beholden to people who want these things because their votes are guaranteed. Deception and feel-good rhetoric are required to get yours. Guess who they’ll serve. Find an issue that’s popular in North Dakota, and Democrats are on the wrong side of it. Compare their campaign marketing to their behavior once elected. A Democrat elected to local office this year could cast the deciding vote for disastrous federal regulation in twenty years. We can’t afford to advance their dangerous ideology based on platitudes and deception.